Sect affiliation also has implications for ethnic identity, which has been a hot topic for contention among the region's Christians more generally. The main competing terms are Arab, Syriac, Aramean, and Assyrian (and of course, Armenian naturally comes among the Armenian Christians). The Arab identity tends to prevail particularly amongst the Melkites and Antiochian Greek Orthodox, for whom Arabic plays a fundamental role as a liturgical language. Given the Assad regime's own emphasis on Arab identity in line with the Ba'athist ideology, it follows that there is some affiliation with the regime on an ideological foundation. Note, for example, my prior overview here of statements by the Melkite Patriarch Gregory III Laham, who in aligning with the regime has placed emphasis on traditional pan-Arab causes such as the Palestinian issue. Another important figure in this context to bear in mind is Mother Agnes Mariam, a Melkite nun of Palestinian origin espousing similar politics and conception of identity to those of Gregory III Laham. Though Jonathan Steeleand others may claim that she is a mere figure for reconciliation among Syrians, it is quite apparent that she is with the regime. 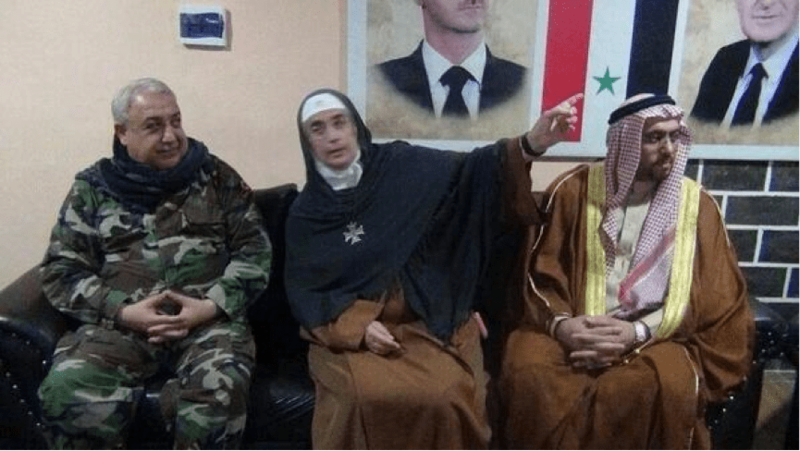 Besides considering the article linked to over her name, it should be noted that Mother Agnes maintains close ties with regime and regime-linked figures, and her apparent reconciliation efforts are merely designed to give the regime a face of legitimacy. On the ground, Melkites and Antiochian Greek Orthodox are particularly concentrated in the Wadi al-Nasara ("Valley of Christians") area of rural west Homs governorate, in proximity to jihadi groups such as Jamaat Jund ash-Sham: a battalion founded by Lebanese muhajireen that subscribes to the same ideology as that of the Islamic State of Iraq and ash-Sham (ISIS), which as regards Christians would mean subjugation to second-class status asdhimmis-paying an extortionist jizya tax- or conversion or death. Unsurprisingly, pro-regime Christian circles in Wadi al-Nasara have not failed to notice the presence of Jamaat Jund ash-Sham. Figure 1: Mother Agnes in Latakia with Ali Kayali, the leader of the pro-regime militia The Syrian Resistance. Photo from autumn 2013. 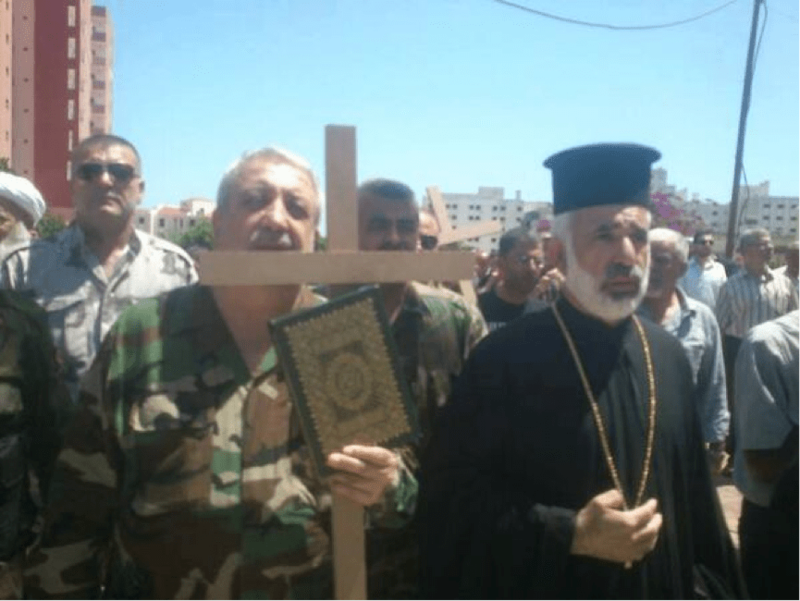 Figure 2: Reflecting traditional Alawite-Christian solidarity, Ali Kayali stands with a Christian clergyman and holds a cross and a Qur'an in solidarity with the Christian victims of the massacre by rebels at Sadad in Homs governorate in late November 2013. The rebels were led by the Green Battalion, ISIS and Jabhat al-Nusra. Figure 3: Ali Kayali has also tried to show a Christian component to his particular cause and associated ideologies (namely, liberating the Sanjak of Alexandretta from Turkish control, and a leftist 'resistance' outlook in opposition to American and Israeli influence in the wider region). In this video from November, he commemorates martyrs from the Sanjak who fought for "the Palestinian cause" against the Israeli occupation of Lebanon. 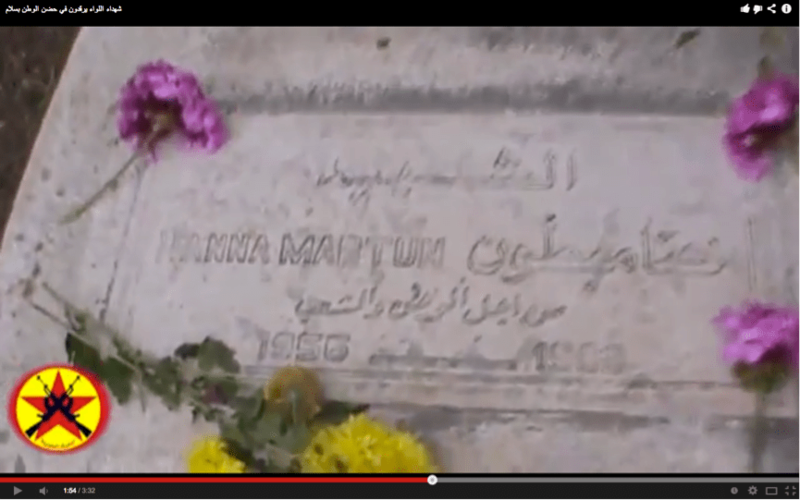 Here, he notes one Hanna Mabtun, a Christian from Antakya, who died fighting the "Zionist enemy" in Lebanon. 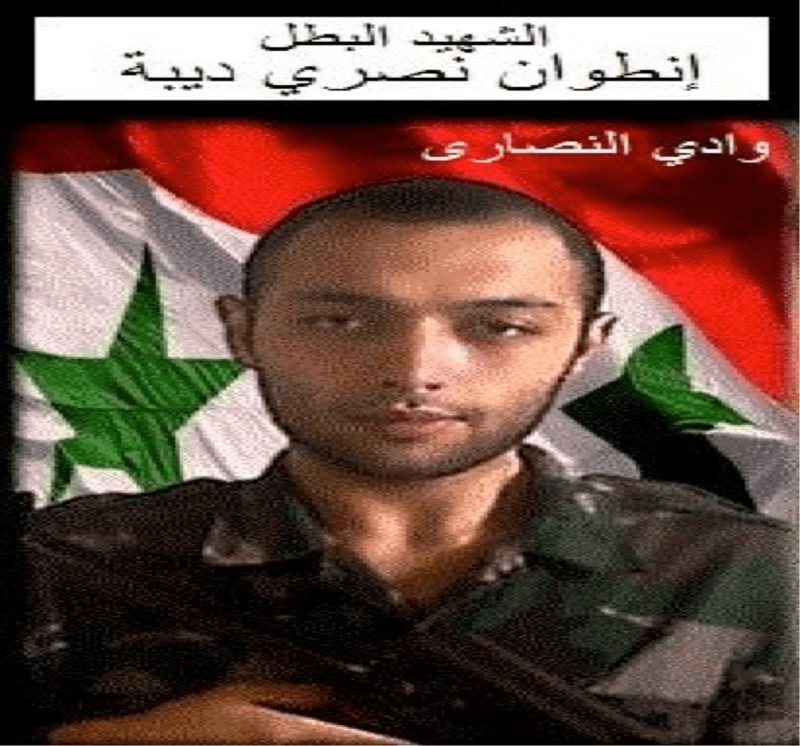 Figure 4: Antoun Nasri Dibah, a martyr from Wadi al-Nasara for Syrian army special forces in Aleppo in mid-November. 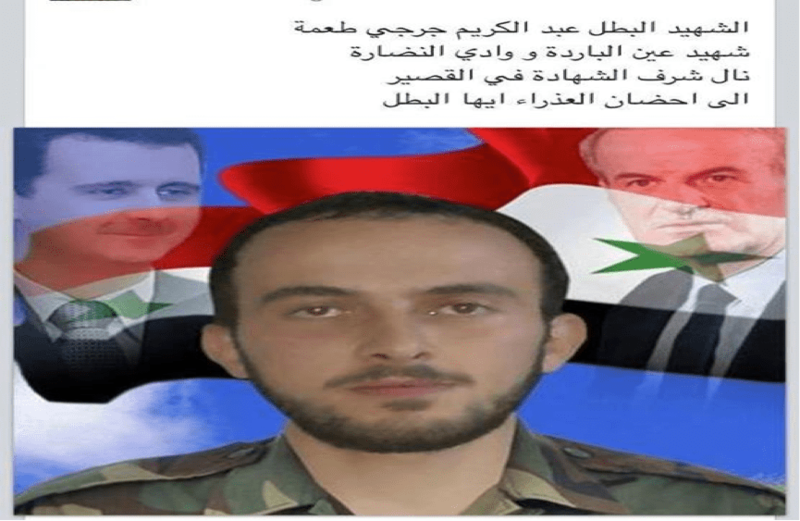 Figure 5: Two more martyrs for the Syrian army from Wadi al-Nasara: Elias Mikhail Nader and Rami Na'im Farah. 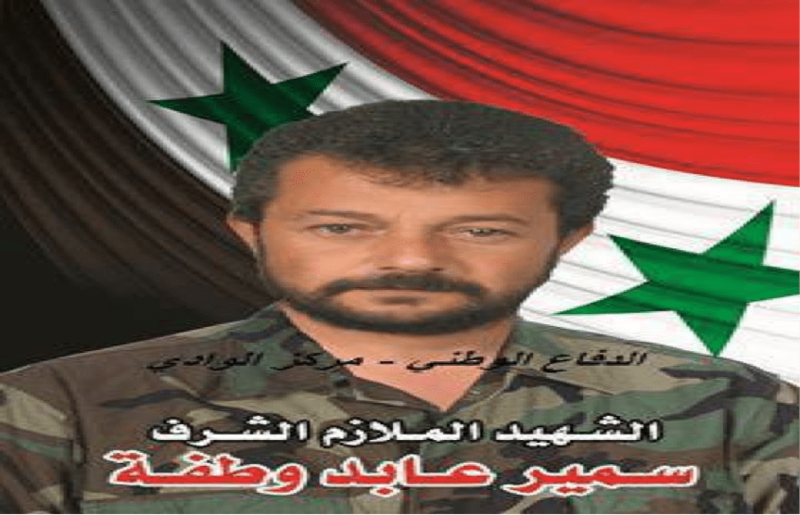 Figure 6: Abd al-Karim Jarji Ta'amah, a regime soldier from Wadi al-Nasara killed during the regime-Hezbollah offensive on Qusayr in late May last year. Figure 7: Elias Othman Jarjous, an army officer from Wadi al-Nasara killed in mid-June last year. 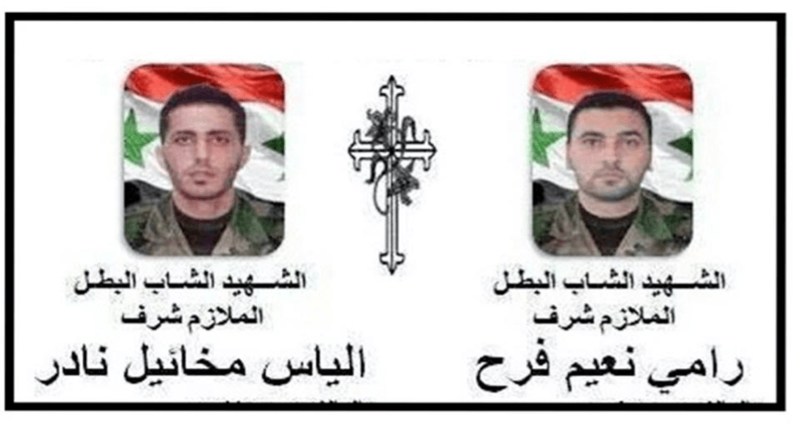 Figure 8: Commemorating 3 Christian fighters for the NDF in Wadi al-Nasara, killed in late August of last year. 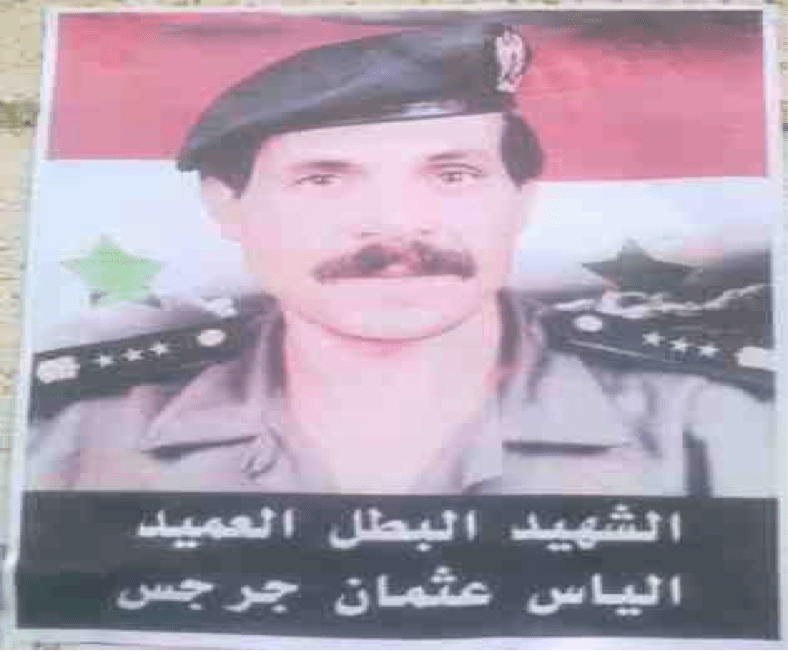 Figure 9: One of the NDF Christian martyrs of Wadi al-Nasara: Samir Aabad Watafa. 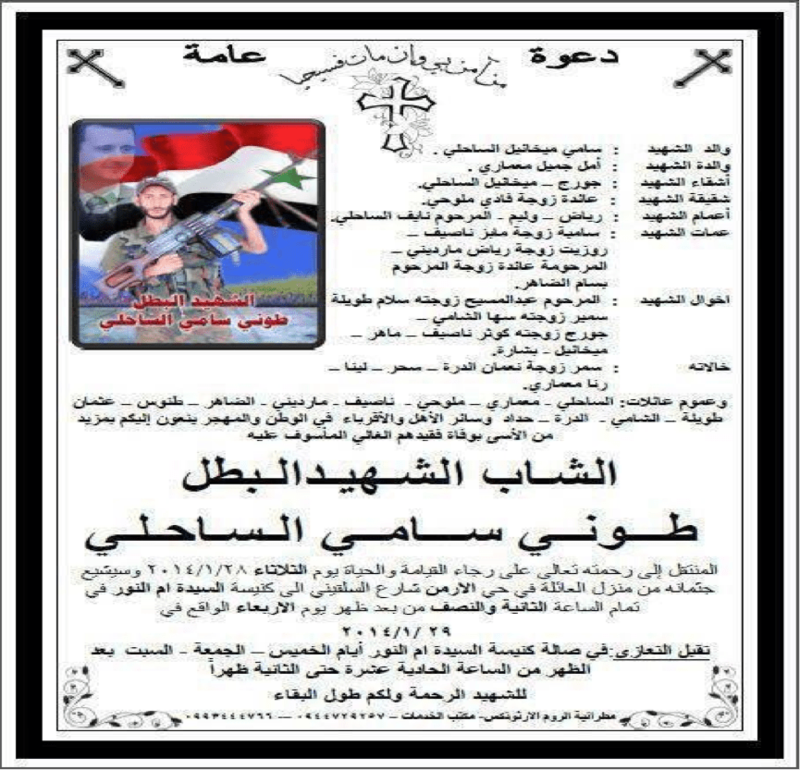 Figure 10: Announcement circulated in Wadi al-Nasara in late January this year on the martyrdom of Tony Sami al-Sahli. Out towards the east of Syria (mostly Hasakah province in the north-east, which has absorbed many internally displaced Christians from Deir az-Zor governorate), the situation is somewhat more complicated, as there is much less propensity to identifying as Arab. Traditionally, Christians in Syria who have not identified as Arabs have had problems with the Ba'athist regime's lack of acceptance of open expression of non-Arab identity. However, like the inhabitants of Wadi al-Nasara, the Christians in Hasakah province must face the reality that the rebels leading offensives on regime and Kurdish-held territory in the province are primarily of jihadi orientation. The most notable of the groups in operation is ISIS, which has recently consolidated its hold in most rebel-held territory in Hasaah province, having subjugated its two main rivals- Jabhat al-Nusra and Ahrar ash-Sham- in the north and central areas with nominal pledges of bay'ah to ISIS, besides seizing the southern border locality of al-Markadah from these two groups. The locality of al-Markadah is strategically important as an entry point into Deir az-Zor province, and so Jabhat al-Nusra has sent up reinforcements from Deir az-Zor province to take al-Markadah, but with no success so far. This reflects the overall strategic stalemate emerging between ISIS and its rivals, whereby ISIS has strengthened its hold on areas where it was previously well-established: namely, Raqqa and Hasakah provinces as well as northeastern Aleppo province. Coming back to Hasakah province, ISIS does have some real allies among other rebel groups: most notably, according to a local pro-ISIS contact, the various groups in the province going by the name of Liwa Ansar al-Khilafa. I have discussed Liwa Ansar al-Khilafa before in my article on fighting on theQamishli Front. In early January, even as infighting broke out between ISIS and other rebels elsewhere, at least one Liwa Ansar al-Khilafa grouping was part of a joint offensive with ISIS, Jabhat al-Nusra and Ahrar ash-Sham on the Qamishli countryside. Thus, a key question facing Christians in Hasakah province is: which actor, if any, can guarantee their protection and interests? 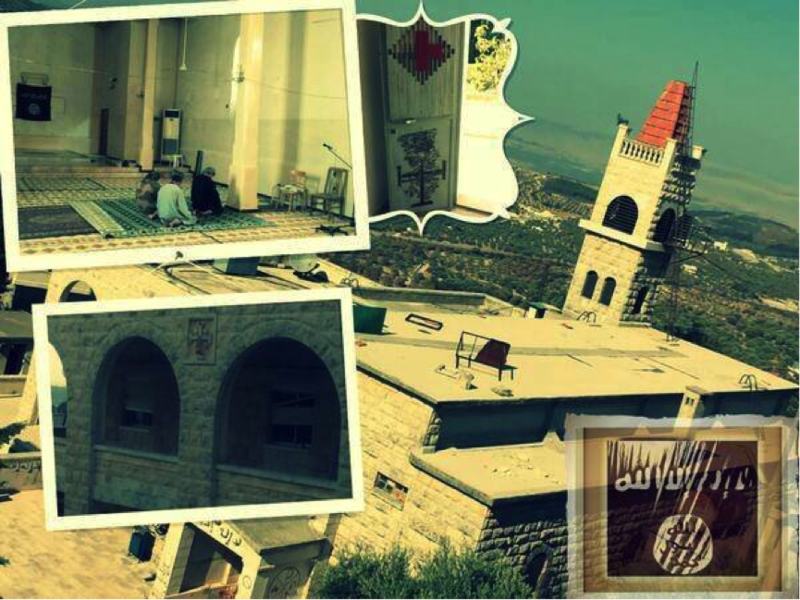 Figure 11: Graphic circulated in ISIS circles last summer denouncing churches as houses of blasphemy against God, in contrast to the mosque as a house of monotheism. 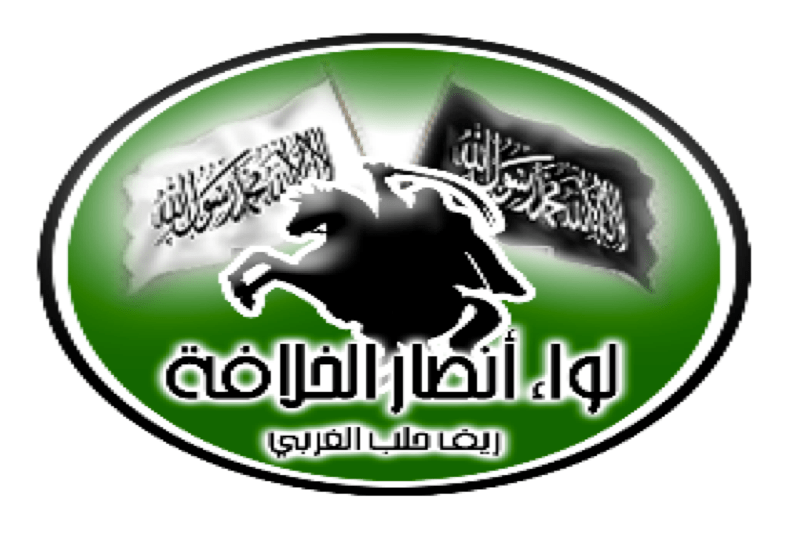 Figure 12: Logo of Liwa Ansar al-Khilafa for western Aleppo countryside, which has participated in fighting against Kurdish and regime forces in Hasakah province, coordinating with ISIS. For the SUP, the answer has been to form its own self-defense militias from youth volunteers, cooperating and training where necessary with the Kurdish YPG (some Christians have gone further and simply joined the PYD's YPG or Asayish police force altogether). 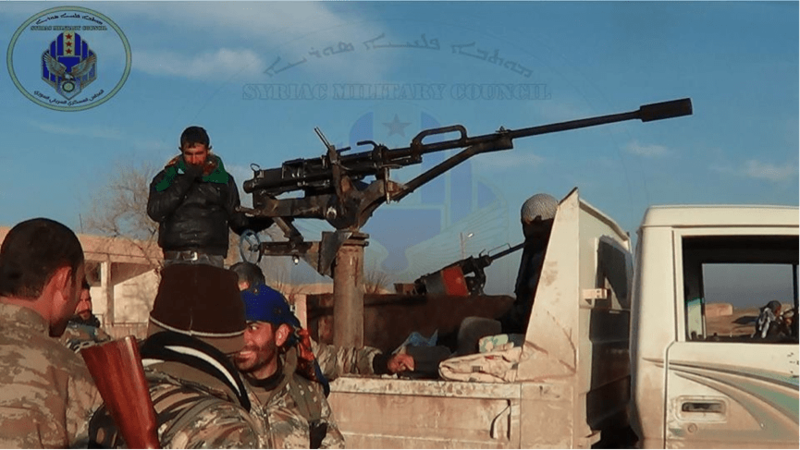 This defense militia is known as 'Sutoro', and began in the town of al-Qahtaniya following the withdrawal of regime forces, spreading subsequently to the towns of al-Malikiya (from which regime forces also withdrew) and Qamishli by spring 2013. Politically, the SUP sees the PYD as the most viable political force to turn towards, and has accordingly declared support for the PYD's unilaterally announced autonomous interim administration. Operationally, Sutoro plays a strictly defensive role. Figure 13: The emblem of Sutoro. Note that the specific Roman spelling 'Sutoro' (as opposed to 'Sootoro', as we will subsequently see) indicates affiliation with the SUP. However, in Qamishli, where a regime presence still remained, events took a different course, as over the course of the summer and fall of last year, the Sutoro branch evolved to become Sootoro, taken over by regime loyalists affiliated with the Civil Peace Committee for Syriac Orthodox in Qamishli. 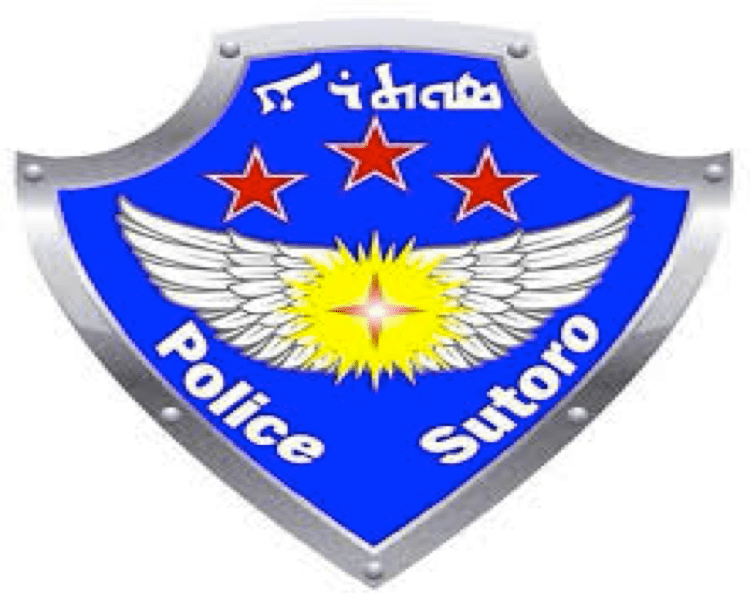 This Sootoro, also known as the "Syriac Protection Office," takes on a strictly defensive role like the SUP Sutoro. However, not only does it have a different emblem from the SUP Sutoro, but the Qamishli Sootoro also claims that theSUP Sutoro to be observed in al-Qahtaniya, al-Hasakah city and al-Malikiya has appropriated its name. Figure 14: The emblem of the Qamishli Sootoro. Commenting on a query in November 2013 asking about Figure 13, the media office for the Qamishli Sootoro stated: "We have previously issued a statement in which we mentioned and confirmed that we have no connection with any armed faction or office bearing our name outside of the city of Qamishli" (for that statement see the URL in the previous paragraph). "Stories have proliferated recently about the arrival of material support for the Sootoro protection office. We in the Syriac Protection Office of Sootoro are affiliated with the Civil Peace Committee for Syriac Orthodox and the committee is the one that offers us support from a headquarters and mechanics (thanks for their efforts). So until this moment nothing has reached us. To offer immediate material support to the Syriac Protection Officer of Sootoro, we have set up a bank account number in Germany and it is in the name of a well-known Syriac working man living in Qamishli." 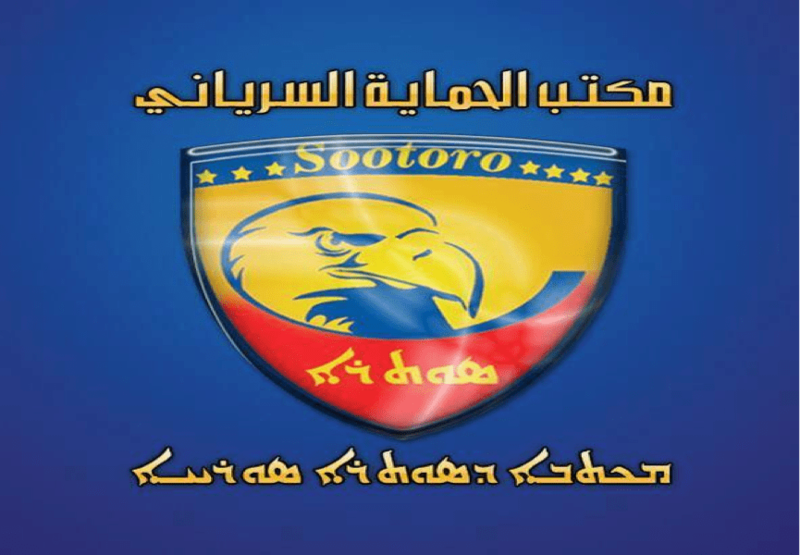 This resource shortage has comes in spite of the attempts of multiple declarations by the Qamishli Sootoro to expand beyond Qamishli and set up Sootoro branches in other towns. Besides a statement noted in my previous article on Qamishli, one should also note a "clarification statement" released at the beginning of December 2013 and in the Turoyo language, making it clear that Sootoro does not distinguish between Christians of different sects- whether Chaldean, Assyrian or the like- as all deserve protection; and that this protection will soon be expanded. It should be noted that the statement is in Turoyo, showing that the issue of identity or language suppression feared in past times is quite irrelevant now and the regime can be looked to as a guarantor of Christian interests in the northeast of Syria. For now, however, the Qamishli Sootoro remains confined to its own town and lacks resources for expansion. Figure 15: Clarification statement in Turoyo released by the Qamishli Sootoro in December 2013. Note the regime flag in their office. 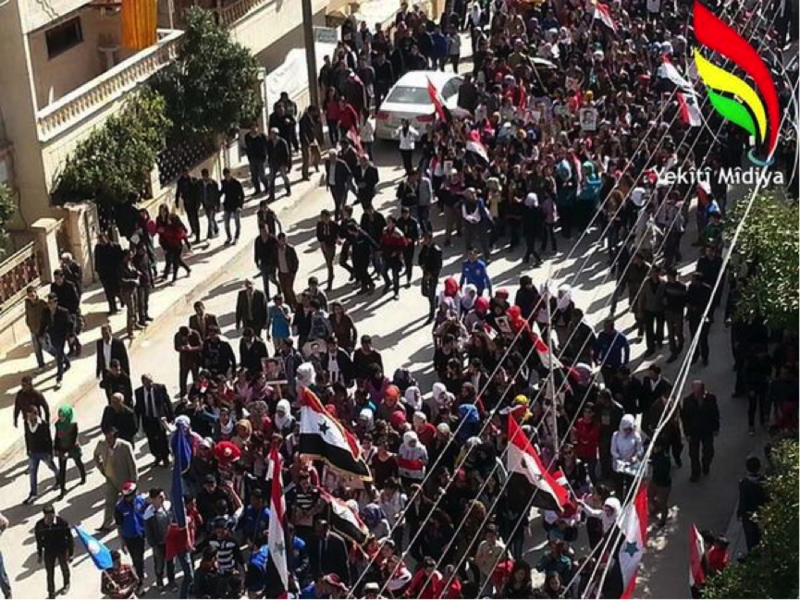 Figure 16: Pro-regime demonstration in Qamishli on 19th February (h/t: Wladimir Van Wilgenburg). 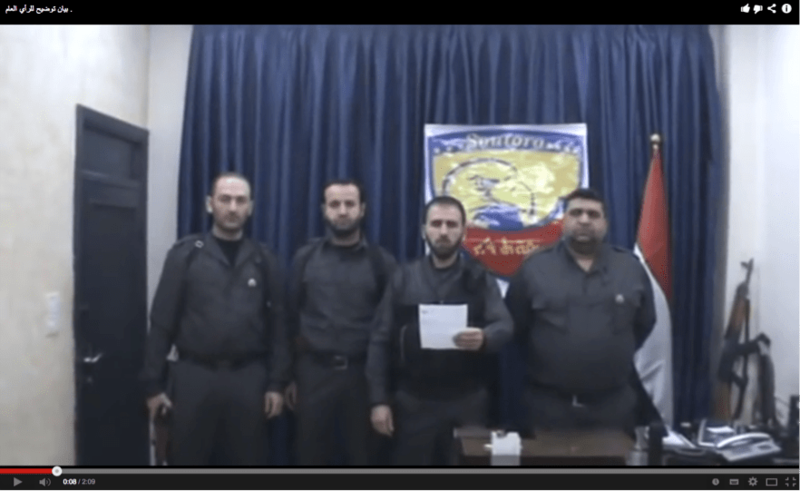 Figure 17: The ADO's leadership- officially against the regime and opposed to the PYD administration- is affiliated with the opposition-in-exile, and on 19th December 2013, regime forces in Qamishli arrested the head of the ADO's political office. However, there is disconnect to an extent on the ground between the leadership and members on the ground. In Qamishli, members of the rival Assyrian Democratic Party- generally seen as pro-regime from the beginning and active since the 1970s- seem to have reached an accommodation with the Qamishli Sootoro and the Civil Peace Committee, both of whom publicized this statement to which it is a signatory. In this statement, the signatories affirm their belief in the need for the unity of Syria's land and people; rejection of foreign intervention in all forms [NB: contrary to the opposition-in-exile], belief in the "necessity of peaceful democratic change," and the rejection of violence and partisanship in all forms [h/t: Hans Scholl for correction; I initially read this as ADO a signatory]. The last main Christian military organization in the northeast to consider is the Syriac Military Council. This body was announced in a video at the beginning of last year, declaring its opposition to the Assad regime and calling for the "liberation of Syria and the fall of the despotic Ba'athist regime and fighting for a just, pluralist, democratic and secular state," while emphasizing no partisan affiliation and repeatedly stressing the need to defend "our people" with their cultural and historical rights. This goes back to the earlier theme I mentioned of the regime's traditional non-acceptance of non-Arab-Christian identity. At the time, the Syriac Military Council had the support of the global Syriac Union Party. 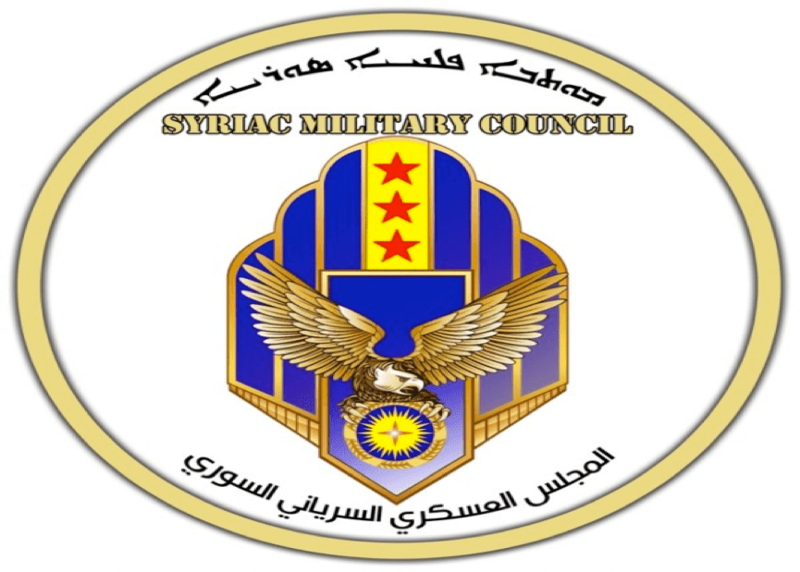 Figure 18: Emblem of the Syriac Military Council. However, with the rise of ISIS and other jihadi groups in Hasakah province, it is clear that the Syriac Military Council's focus has shifted entirely to combating jihadis. 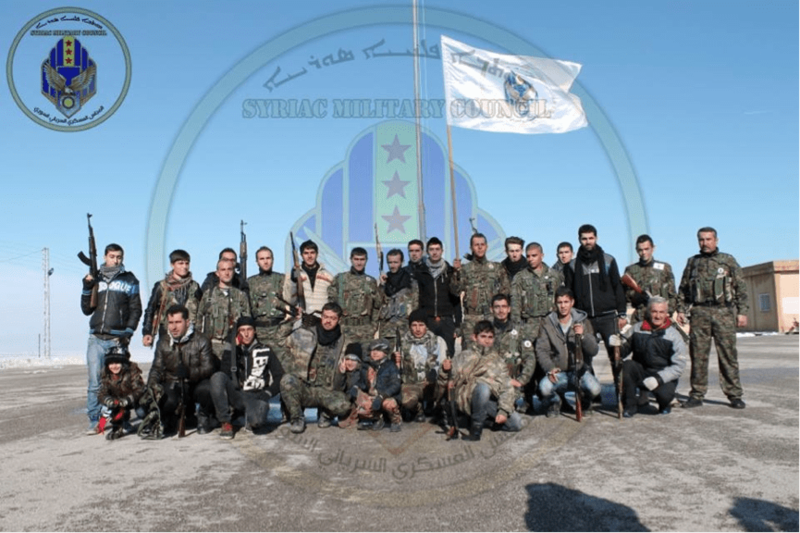 Indeed, the group had largely been dormant for much of 2013 but emerged as an active player towards the end of the year, eventually announcing its full joining of the YPG in January 2014. Since then, the Syriac Military Council has not only played a role in defending Christian areas but has also worked with the YPG in its offensives to retake territory from the jihadis. 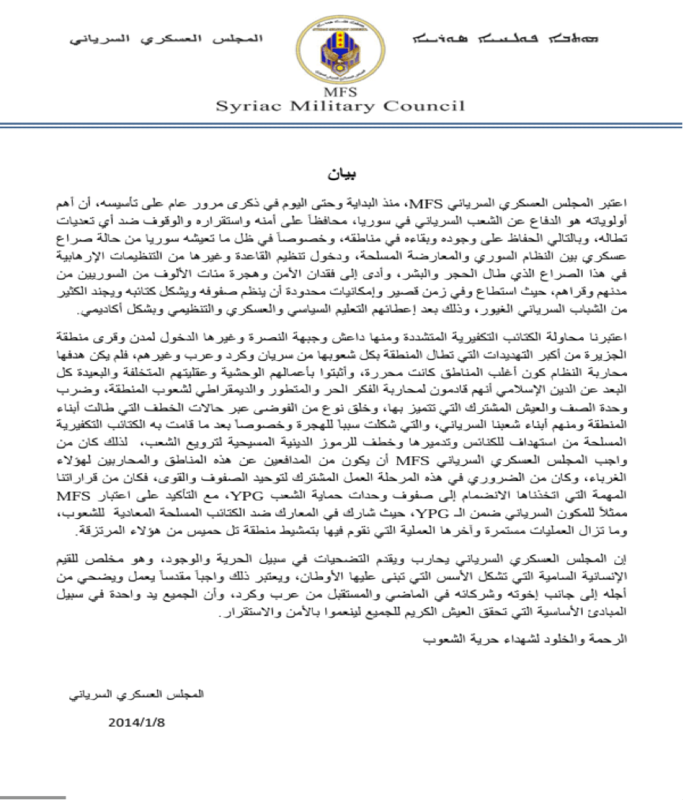 Figure 19: Syriac Military Council statement joining the YPG. The key part to note is: "We have considered the attempt by the extremist takfiri battalions- among them ISIS, Jabhat al-Nusra and others- to enter the towns and villages in the al-Jazira region to be among the greatest of threats facing the region with all its people of Syriacs, Kurds, Arabs and others, and its aim was not to fight the regime since most of the areas have been freed." The statement describes the jihadis' conduct as "far removed from the Islamic religion": including the "targeting and destruction of churches, taking Christian religious symbols to terrorize the people." So to unite defense forces fighting the jihadis, the Syriac Military Council joined the YPG. Figure 20: Syriac Military Council fighters in Tel Hamees as part of the recent YPG operations against ISIS in the area. Figure 21: Another photo of Syriac Military Council fighters in Tel Hamees area. Figure 22: Syriac Military Council recruits. Figure 23: Syriac Military Council fighters. Figure 24: Syriac Military Council flag. 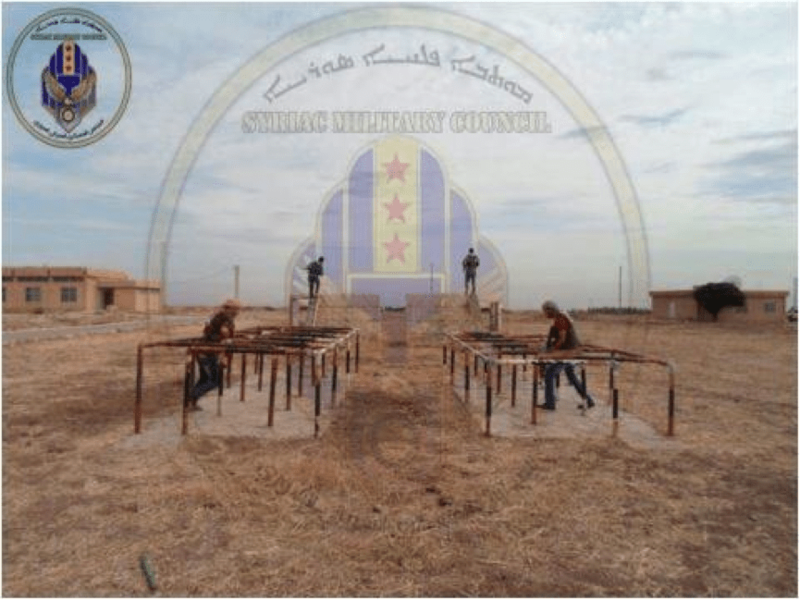 Figure 25: Training exercises for the Syriac Military Council. "This council was established with the sponsorship of the Syriac Union Party…it is trying to recruit youth with a salary of 20,000 Syrian liras of unknown financial sourcing. 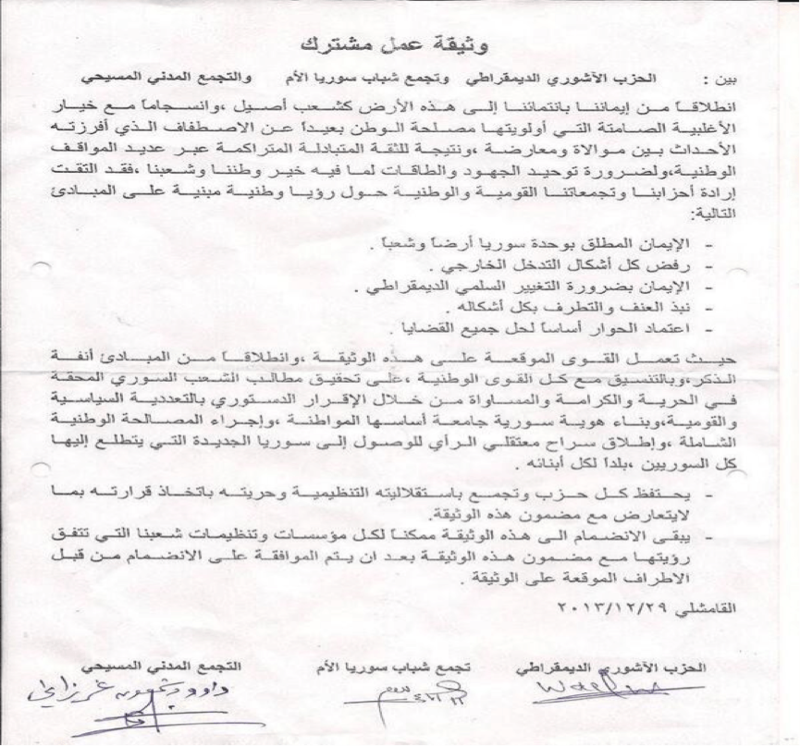 This council claims that it was founded to protect Christians in the areas they are found in Hasakah province. 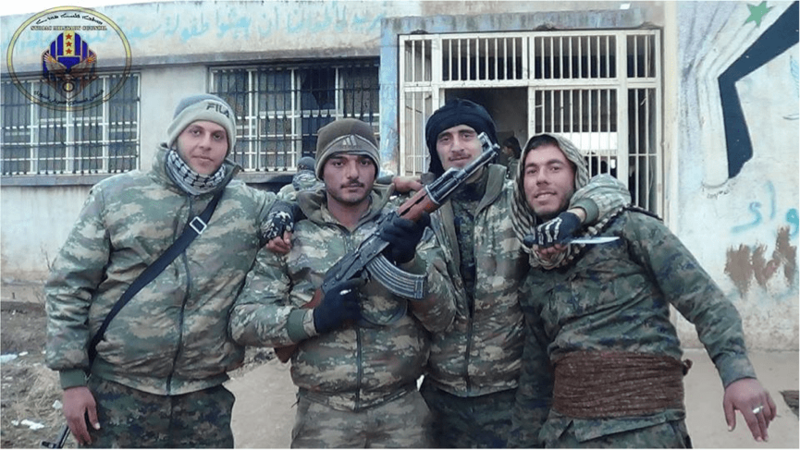 It has recently undertaken to create fitna between Arabs and Christians in Hasakah province by fighting against them in the villages of Tel Hamees despite knowing that the villages of Tel Hamees are solely Arab and there are no Christians or churches found in the area. As Christian people we totally reject this conduct and it will never represent us since we call for peace and not transgressing on other people's areas. We protect our regions and resist any attack from foreigners against us but we do not attack others. We as Christian people affirm that this Syriac Military Council will never represent us but it only represents the forces that support it in the Syriac Union Party." It is certainly true that SUP members know of the Syriac Military Council's activities and offered support for the group when it was first established. 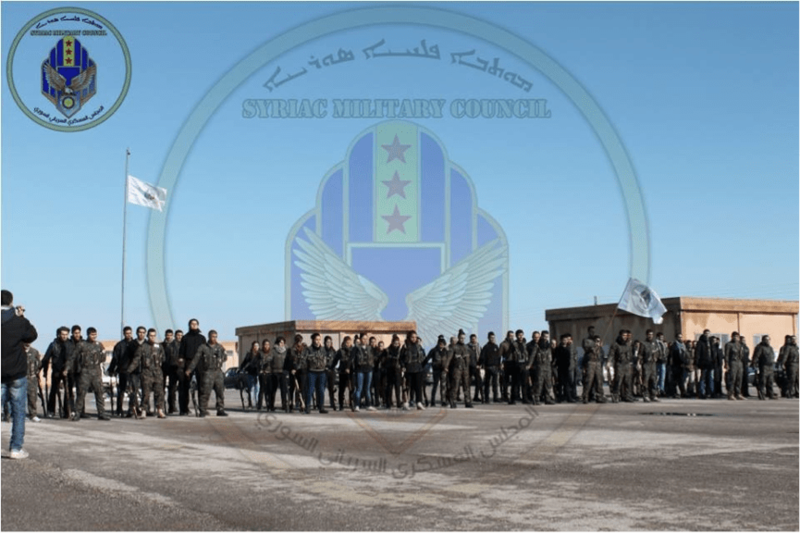 When the Syriac Military Council re-emerged, an activist for the "Syrian Syriac Union" said in an interview with Iraqi outlet Sumaria News: "The Syriac Military Council began its activities recently in the establishment of a military forces comprising 300 members of both genders. The establishment of the force aims to protect our lands and defend Syriac citizens and the Syriac cause in the al-Jazira region. All members of the force are volunteers, receive professional military training and carry Russian rifles and weapons. The force is affiliated with the Syrian Syriac Union." However, it should be noted that the Syrian Syriac Union is not the same as the SUP, as both the head of the SUP and a representative of the European Syriac Union made clear to me that the Syriac Military Council is independent of the SUP. 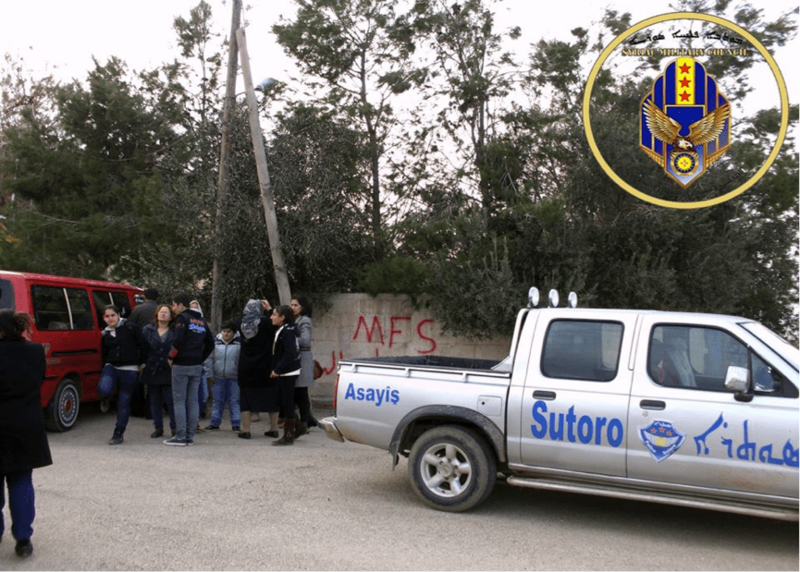 That said, it is evident that the Syriac Military Council coordinates with the SUP loyalist Sutoro, and the SUP maintains cordial relations with the Syriac Military Council, perhaps even offering some kind of financial support. Figure 26: Syriac Military Council photo featuring a Sutoro truck. Christian militia and political dynamics in Syria are by no means as simple as notions that all Christians side with the regime or look to the regime as their protector. As we have seen, sect affiliation and geography matter here, and divisions in alignments are particularly sharp in northeastern Syria. However, one common thread is apparent: the rebel forces on the ground have overwhelmingly failed to attract Christian support for their cause, however many Christians may be in the opposition-in-exile. Christians on the ground look to the regime, Kurds or have formed their own independent groupings generally working with the latter while opposed to the regime, but they have not joined the various FSA-banner formations or other main rebel groupings in significant numbers. One of the biggest failings of the rebels in this regard is the degree to which they have allowed jihadi groups to grow, particularly Jabhat al-Nusra and ISIS. Of these two groups, the former is still the subject of much praise from rebels of all kinds in light of the fighting between ISIS and other rebel groups. Though Jabhat al-Nusra has been hailed as somehow magnanimous towards Christians because it protected the churches in Raqqa following the fall of the city to rebels in March 2013, this narrative is deeply flawed. As al-Qa'ida envisions it, preventing Christian places of worship from being harmed is to be expected provided Christians accept second-class dhimmistatus as accorded by Qur'an 9:29. Even once ISIS came into being in Raqqa, the churches were not harmed for some months. That they were eventually taken over by ISIS and converted into da'wah offices is simply the culmination of the dwindling of the Christian community in the city to negligible size. Indicative of the importance of dhimmi status is the case of Tel Abyad, which saw its Armenian church desecrated by ISIS on the grounds of violation ofdhimmi conditions. Elsewhere, al-Qa'ida's ideals have not always translated into reality. In Tabqa, the situation was somewhat different, as desecration and looting of Christian property, with the destruction of local churches, began in earnest once rebels including Jabhat al-Nusra took over the city. This happened, it should be noted, before the announcement of ISIS. 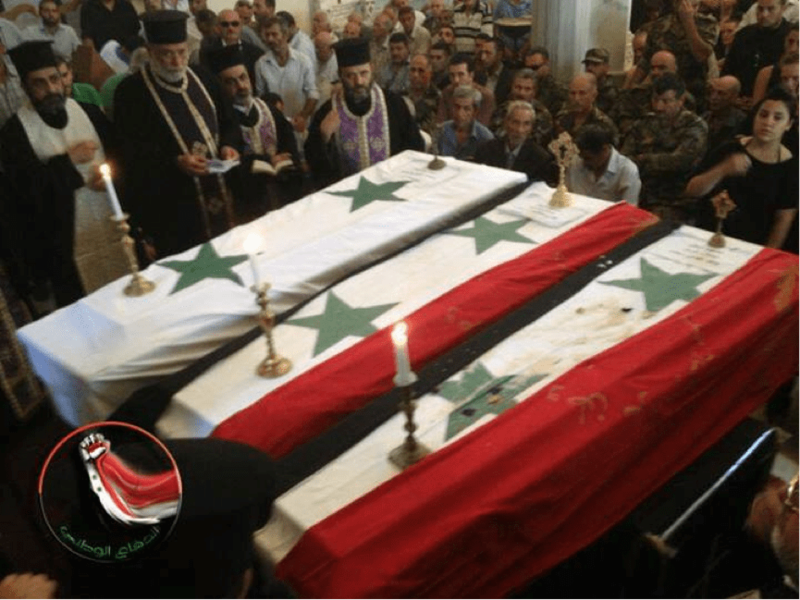 In any event, Jabhat al-Nusra was also a participant in the Sadad massacre of Christians, and is accused by the Syriac Military Council of being behind the burning down a specific church in Qamishli countryside. Simply blaming any abuses that happen against Christians on ISIS- typically characterized as a foreign-dominated group- is a distortion of the record that diverts attention from the rebels who abetted the rise of the jihadi groups. 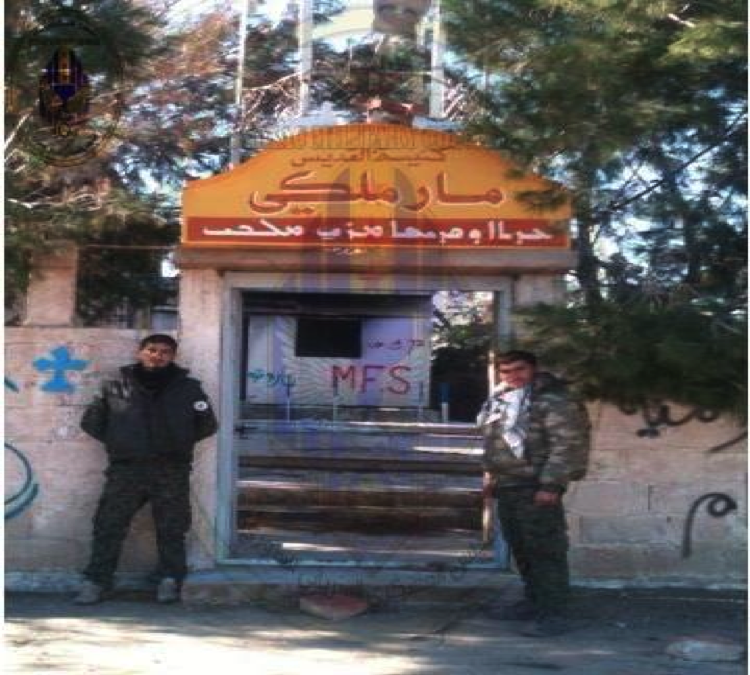 Figure 27: Syriac Military Council fighters outside what was the Mar Malki church in Qamishli countryside, said to have been burnt down and desecrated by Jabhat al-Nusra. Linked to the point on the growth of jihadi groups is another key rebel failing: namely, the obsession with the YPG as a supposed agent of the regime and the desire to take over its areas of control. Whatever the supposed rights or wrongs of the YPG, strategically for the rebels, fighting with the YPG has proven to be merely a waste of resources, particularly on the Hasakah front. Even now, the fighting with the YPG produces an odd cognitive dissonance in the discourse of rebels and pro-FSA-banner activists in particular: namely, despite the fact that ISIS-widely accused by FSA-banner rebels and their supporters of being a regime agent- dominates the rebel front in Hasakah province, there is nonetheless condemnation of the YPG as it makes advances against ISIS, with accusations of the YPG being a regime agent. Thus did prominent pro-FSA Twitter activist "Jad Bantha" decry the "pro-Assad YPG Kurdish militias" for a supposed "massacre in Tal Barek [Tel Barak]." Unless one wants to suppose an elaborate game devised by the regime to set its agents off against each other, one wonders how it can be claimed, as Bantha constantly tries to insinuate, that ISIS is a regime agent if it is fighting the YPG, a supposed agent of Assad (and indeed, unlike ISIS, the YPG does have a de facto though nebulous territorial accommodation with the regime in Qamishli). Yet this hostility to the YPG extends beyond the realms of social media: one should note the opposition-in-exile's condemnation of the YPG for the takeover of the border town of Yaroubiya despite the fact that the takeover involved the expulsion of ISIS and Jabhat al-Nusra. The point is that this enduring rebel hostility to the YPG- when considered along with the growth of the jihadi groups- has prevented the reaching of any kind of cordial understanding with the YPG and the PYD, which in turn might have been able to persuade more Christians in the east of Syria of the validity of the rebel cause. Instead, all that has happened is the boosting of the PYD's and regime's status as protectors of Christians. Thus far, the current attempts in opposition circles to try to counter the regime's narrative of its being protector of Christians consist of pointing to incidents of regime bombing that have struck Christian areas and led to damage of churches. One example is the bombing of Tel Nasri in Hasakah province in November 2012, which damaged the village church. However, the opposition counter-narrative is ultimately unconvincing and hardly equates to a supposed persecution campaign against Christians by the regime, for the incidents in question are exceptional in nature, and merely reveal that the regime has scant regard for civilian casualties or historical heritage sites when it bombards areas in attempts to flush out rebels. One should compare with the regime's willingness to bombard the Krek des Chevaliers area to rid it of Jamaat Jund ash-Sham, which uses the site as a base. Of course there would still be Christians supporting the regime- particularly among the senior clergymen- regardless of whether the rebels strike an accord with the PYD, but to state it more generally, the most sensible policy for rebel groups to pursue would be simply to leave Christian areas alone (just as they should leave Druze areas alone), though given the overall lack of rebel unity and the prominence of jihadi groups, it seems doubtful whether such an approach can be implemented at this stage. Update (6 April, 2014): Sootoro denies that the blue flags in Figure 16 are of their organization. 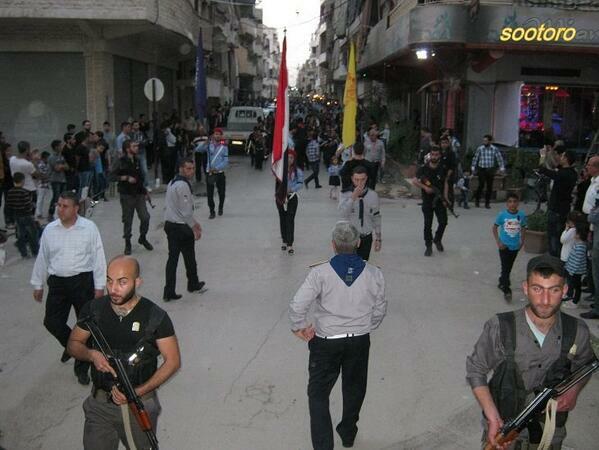 It would seem a closer view of these pro-regime demonstrations in Qamishli corroborates their denial. 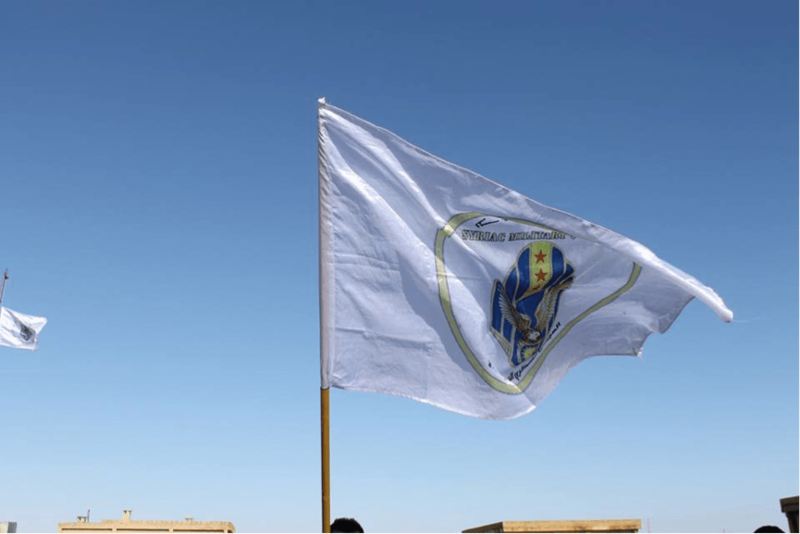 Update (and correction), 25th April 2014: As regards Figure 16, it should be noted that the Qamishli Sootoro deny the blue flags are associated with them. On closer observation, the denial is correct, hence I have updated accordingly. However, note this photo released by Sootoro with the regime flag on parade in Holy Week this year, guarded by members of Sootoro (at the very front).